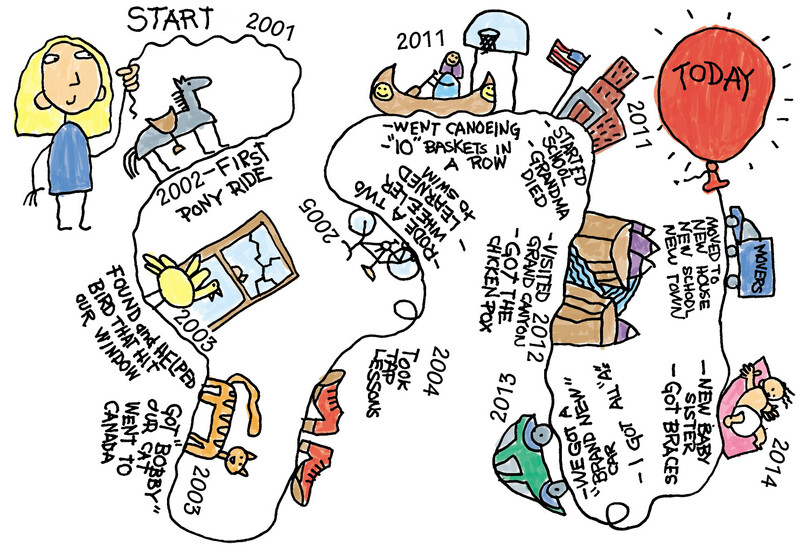 A life map is a visual time line. It traces key moments in your life from the time you were born until the present day. The events and experiences you draw in your life map can make great starting points for writing topics, particularly for personal writing. Your Turn Create your own life map. Start your life map with the day you were born. Record the dates of key moments in your life in time order. Draw each event to help you remember it. End your life map with the present day. Drawing a Life Map by Thoughtful Learning is licensed under a Creative Commons Attribution-NonCommercial-ShareAlike 4.0 International License. Based on a work at k12.thoughtfullearning.com/minilesson/drawing-life-map.